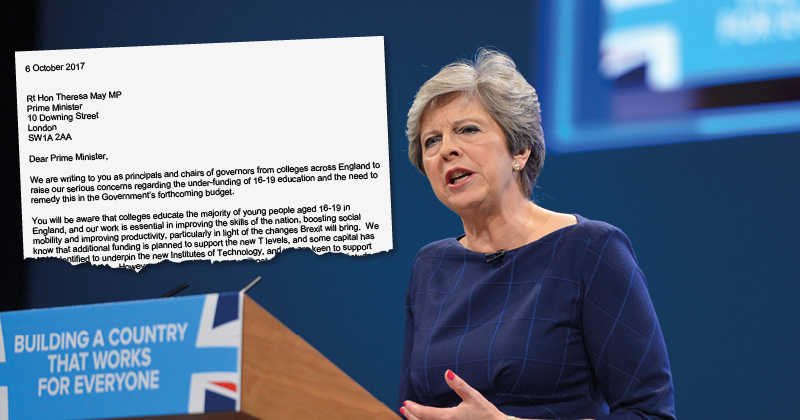 Principals and chairs from 140 colleges have written to the prime minister begging for more funding for 16- to 19-year-old learners. They want the prime minister to address long-term underfunding for that age group. “Our students are now in danger of studying an impoverished curriculum, which has already reduced in breadth and choice, and cannot prepare our young people to take their place in employment and compete in a global economy,” they wrote in the letter. “You will be aware that colleges educate the majority of young people aged 16-19 in England, and our work is essential in improving the skills of the nation, boosting social mobility and improving productivity, particularly in light of the changes Brexit will bring. “We know that additional funding is planned to support the new T-levels, and some capital has been identified to underpin the new Institutes of Technology, and we are keen to support these developments. An AoC spokesperson complained that in England, the current base funding level for 16- to 18-year-olds is £4,000 per year, which “decreases to £3,300 at 19”. Such funding covers around 600 teaching hours per year – equivalent to around 15 hours per week, according to the Sixth Form Colleges Association, which “compares poorly with countries such as Denmark, which has a minimum number of 26 teaching hours per week, the Netherlands, which provides 1,000 hours per year, and Norway, which offers 980 guided learning hours per year”. College leaders are asking for an immediate £200 uplift to the base funding rate per student, to help maintain the breadth of provision and help attracted and retain teachers and trainers. “This is not just a funding issue, it’s a moral issue and should deeply concern every one of us,” said David Hughes, the chief executive of the Association of Colleges. “How can we expect our young people, whether at school or college, to get the support and education they need to progress in their chosen path without the right investment? “The government has already made a welcome funding commitment to increase the teaching hours for the incoming T-levels, but this will cover only around 25 per cent of 16- to 19-year-olds. The Association of Colleges said it will be working with other organisations, including the Association of School and College Leaders and the National Union of Students, to highlight the issue ahead of the autumn budget. The SFCA’s campaign, launched in May, also calls for an additional £200 funding per sixth form student, along with a call for VAT to be scrapped for all sixth form providers. “Sixth form students in England are being short changed – if the government is serious about improving social mobility, raising standards and increasing productivity it should prioritise this modest increase in funding in the forthcoming Budget.